I’m an aviation geek, which means I love all things related to planes (even if I’m terrified of flying). Planes fascinate me. They have like 8,000 parts and weigh multiple tons but still manage to stay up in the sky without falling apart! I mean have you ever seen one of those bolts holding up a wing? It boggles my mind how such a tiny thing can hold so much weight. Thank you, aerodynamics, engineering, and the workers at Airbus and Boeing! 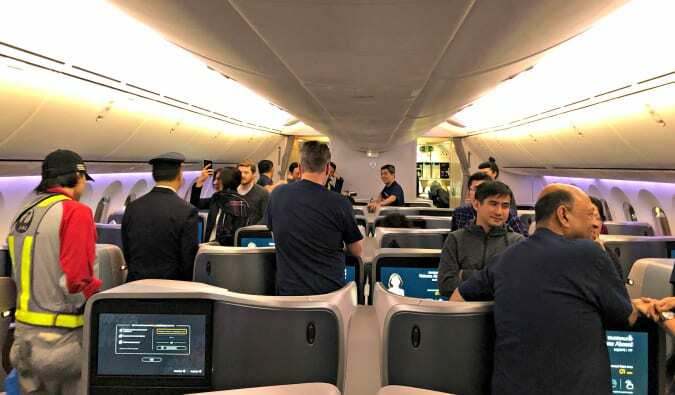 In March, I was invited to the Boeing plant in South Carolina for the delivery of Singapore Airlines’ new 787-10, the first 10-series Dreamliner plane. As part of the invited media crew (including some other AV geeks, like Brian Kelly, Ben Mutzabaugh , Zach Honing, and Kendis Gibson), we spent a few days at the plant (in my next post, I’ll take ya behind the scenes at the Boeing plant and in the flight simulator) and then flew the delivery flight from Charleston to Singapore. It was truly one of the coolest experiences I’ve ever had. For those other guys, it’s par for the course. They go on these all the time. But, for me, this was brand new! I mean, getting invited to the factory and then to fly on the first flight? Woah! So cool. But South Carolina to Singapore is a long flight. The total flight time is 22 hours. The total time on the plane for us? 24.5 hours, as we weren’t allowed to leave the airplane during our refueling stop in Osaka. That’s right. I spent a little more than an entire day inside an airplane. We board the plane (Boeing has their own gateway at their plant), where we are greeted by the crew and Singapore Airline executives. I sit down in my business-class seat, get my pre-flight champagne, and marvel at the new in-flight entertainment (IFE) system. It was the best I’ve seen. The screen is huge and super sharp, and the system saves all your information and preferences so you can get back to your movies quickly. It also minimizes the back-and-forth between menus by keeping options open at the bottom of the screen while you scroll and loads them without having to toggle. Compared to the crappy IFEs we have in the states, it was like magic. After takeoff, I start to watch Justice League. It’s terrible, so I move to the galley to get drunk…I mean sample the wine selection. OK, we got drunk. There’s no other way to put it. Those flight attendants pour heavy glasses. Continue to drink in the galley. After getting sufficiently toasted, I bid everyone good night and go back to my seat. While the other AV geeks pick apart the seat for length, angles, cubby access, and everything in between, I am just happy to be able to sleep in such a wonderful seat. The seat is 26 inches wide, which is plenty long enough for a guy like me. 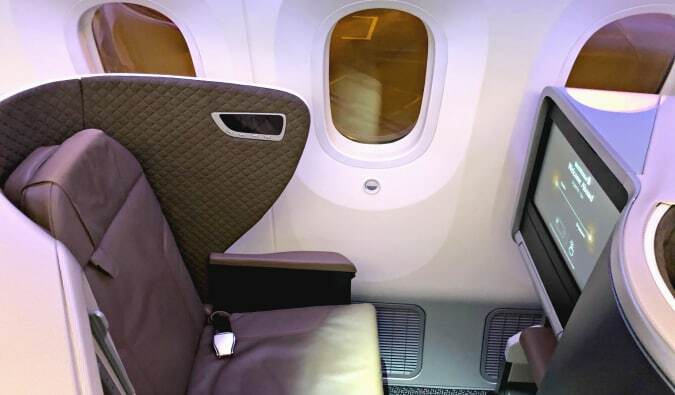 The padded interior muffles noise and is set back enough so that you can create a little cocoon hidden from the rest of the cabin. Dreaming of Batman. Wait? Am I Batman? Still out like a light. Eventually, I come to and pound some water to get rid of my hangover. I feel pretty good for someone who got just six hours of sleep. I wander the cabin quietly as most of the other passengers on the plane are still asleep. I have the dinner I missed and begrudgingly finish Justice League (seriously, it’s terrible). Now, I’m going stir crazy because I’ve been in this plane for 12 hours and still have another 12 more to go! I drink another glass of wine and keep on writing. It’s pretty unexciting. I’m at the point where the novelty has worn off and start to fidget around. Work some more while watching Geostorm (another terrible movie). I’m not sure what is with me and terrible movies but I seem to gravitate towards them on planes. I think it’s because it’s good time to just get lost and not think. I just want to see cheesy plots and stuff blow up. The cabin lights finally come on and we get ready to land. There’s a light snack, I write some more, and then get to reading a book. After 16 hours, we’re in Osaka. By now, you’re probably wondering how the plane made it so far? I mean this plane is only supposed to be able to go fly around 8,055 miles and Osaka is 7,255 miles away. Simple: without a fully loaded cabin of people and luggage, the plane was extra light and can make it very far on a very full tank of gas! 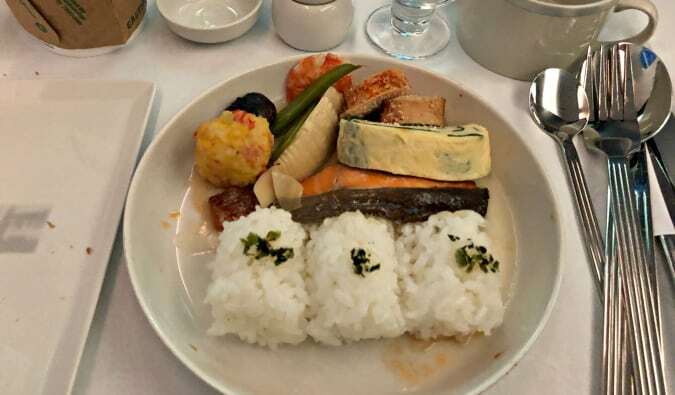 While on the ground, they refuel the plane, switch out the crew, and bring in some new food (catered by Singapore Airlines this time and not Boeing). I watch all journalists make videos and do interviews then chat with the CEO of Singapore Airlines, who gives me some sushi recommendations in Singapore (I never got to eat at them but he recommended Kuiiya and Chobei). The most I did was take some photos. After another breakfast (delicious eggs with spinach and seaweed), I move to economy class to see what it’s like back there while trying not to wake up all the Singapore Airlines employees trying to sleep. There’s a lot of legroom and the seat has a steep recline (which is good when you recline but bad when the person in front of you reclines since it cuts off a lot of your space). The seats are also really comfy and with a soft padding. After Qatar’s A350 economy, they might be my favorite economy seats. I take advantage of having my own row in economy to go for another nap. Time to land in Singapore. 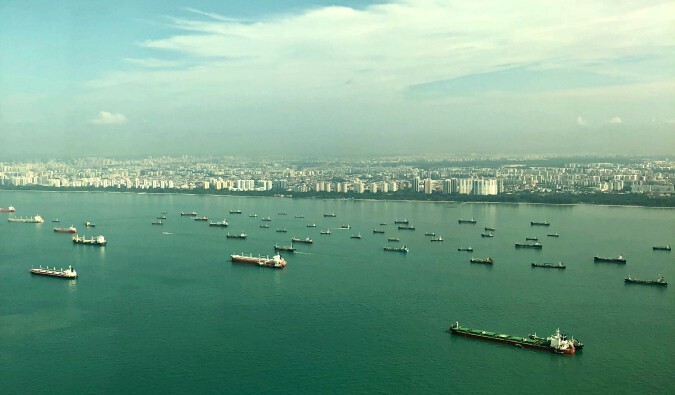 I’m always awed by the fleet of cargo ships off the coast of Singapore. As far as the eye can see, the denizens of global trade go to and fro as we land and pull into the gate, we are welcomed with water cannons and a celebratory event. ***Spending 24 hours in a plane was an experience I’ll (probably) never have again, but surprisingly, it wasn’t as bad as I had thought it would be. The Dreamliner is pressured at only 6,000 feet compared to other planes which are pressured at altitudes around 8,000 feet. feet. So, walking off the plane, I felt pretty refreshed and less fatigued. I never really noticed it before but after spending 24 hours in a tube, that science Boeing was talking about does really hold up to snuff. 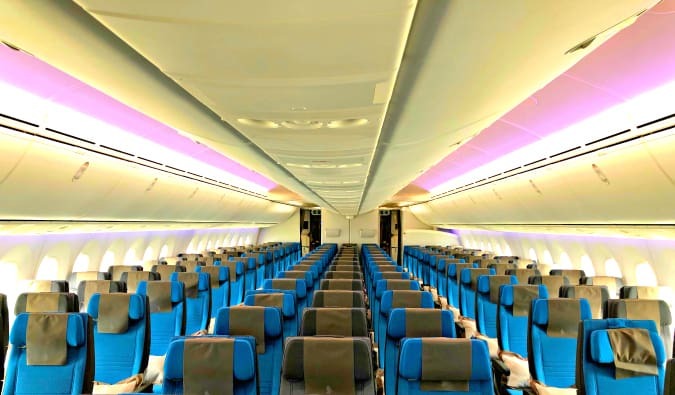 This new Singapore 787-10 will be a regional craft so, at most, you’ll be in this plane for only about six hours. They are only going to fly it around Asia and Australia to start. I would say this will be one of the nicest six hours you’ll have on a plane, no matter what class you are in. 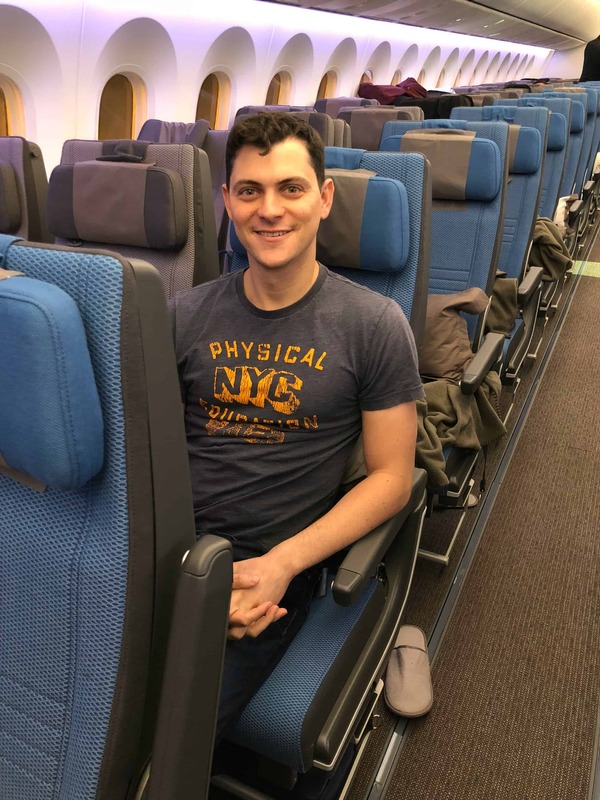 I have a new favorite plane to fly around Asia, which, thanks to Singapore’s partnerships with Chase, American Express, SPG, and Citi, as well their partnership with United means I can use points to do it for free! I already was a huge fan of Singapore Airlines and this plane just makes me love them even more! But, the next time I get on this plane, I’ll be happy it won’t be for another 24 hours. That’s a little too long for me. Note: I was part of the press core for the launch of this plane. Singapore Airlines covered my hotel, flight, and any meals I had during official events. I was not compensated monetarily for this. The post How to Spend 24 Hours in an Airplane appeared first on Nomadic Matt's Travel Site.